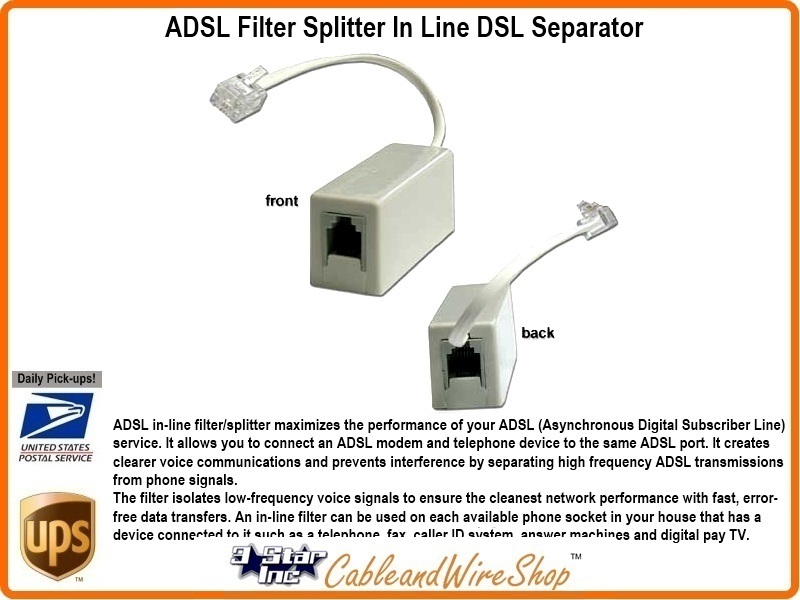 ADSL In-Line filter/Splitter Maximizes the performance of your ADSL (Asynchronous Digital Subscriber Line) service. It allows you to connect an ADSL modem and telephone device to the same ADSL port. It creates clearer voice communications and prevents interference by separating high frequency ADSL transmissions from phone signals. The filter isolates low-frequency voice signals to ensure the cleanest network performance with fast, errofree data transfers. An In-Line filter can be used on each available phone socket in your house that has a device connected to it such as a telephone, fax machine, caller ID system, answer machines and digital pay TV. These are the Jacks that can be simply added anywhere at anytime exterior to wall or kickboard. With one or two Keystone type ports, you can jack it out with any keystone port available. These jacks can be applied with 2-sided tape or screwed down for permanent installations. Perfect for after construction exterior wiring during remodel or re-location in Home or Office. The registered jack designation describes a wiring pattern and not just the physical geometry of the connectors; inspection of the connector will not necessarily show which registered jack wiring pattern is used. The same modular connector type can be used for different registered jack connections. Strictly, registered jack refers to both the female physical connector (modular connector) and its wiring, but the term is often used loosely to refer to modular connectors regardless of wiring or gender, such as in Ethernet over twisted pair. There is much confusion over these connection standards. The six-position plug and jack commonly used for telephone line connections may be used for RJ11, RJ14 or even RJ25, all of which are actually names of interface standards that use this physical connector. The RJ11 standard dictates a 2-wire connection, while RJ14 uses a 4-wire configuration, and RJ25 uses all six wires. The RJ abbreviations, though, only pertain to the wiring of the jack (hence the name registered jack); it is commonplace but not strictly correct to refer to an unwired plug connector by any of these names. Modular connectors were a development from the older telephone connectors, which were very bulky or wired directly to the wall and therefore not accommodating of modular systems. The common nomenclature for modular connectors gives the number of contact positions and the number of wires connected, for example 6P indicate a six-position modular plug or jack. A six-position modular plug with conductors in the middle two positions and the other four positions unused is called a 6P2C. RJ11 uses a 6P2C. The connectors could be supplied with more pins, but if more pins are actually wired, the interface is no longer an RJ11. The original RJ45S used a keyed 8P2C modular connector, with Pins 5 and 4 (the middle 2 positions) wired for tip and ring of a single telephone line and Pins 7 and 8 shorting a programming resistor. It was meant to be used with a high speed modem, and is obsolete today. RJ45 will now refer to the pin assignments for the attached cable, which are actually defined as T568A and T568B in wiring standards such as TIA/EIA-568-B. The shape and dimensions of an 8P8C modular connector are specified for U.S. telephone applications by the Administrative Council for Terminal Attachment (ACTA) in national standard ANSI/TIA-1096-A. This standard does not use the short term 8P8C and covers more than just 8P8C modular connectors, but the 8P8C modular connector type is the eight position connector type described therein, with eight conductors installed. The international standard is ISO-8877. For data communication applications (LAN, structured cabling), International Standard IEC 60603 specifies in parts 7-1, 7-2, 7-4, 7-5, and 7-7 not only the same physical dimensions, but also high-frequency performance requirements for shielded and unshielded versions of this connector for frequencies up to 100, 250 and 600 MHz, respectively. Connectors are frequently terminated using the T568A or T568B pin/pair assignments that are defined in TIA/EIA-568-B. If you carefully examine the drawings to the right you will see that the copper connections and pairing are the same, the only difference is that the orange and green pairs (colors) are swapped. A cable that is wired as T568A at one end and T568B at the other (Tx and Rx pairs reversed) is a "crossover" cable. Before the widespread acceptance of auto-MDI/MDIX capabilities a crossover cable was needed to interconnect similar network equipment (such as hubs to hubs). A cable wired the same at both ends is called a "patch" or "straight-through" cable, because no pin/pair assignments are swapped. Crossover cables are sometimes still used today to connect two computers together without a switch or hub, however most Network Interface Cards (NIC) in use today are called smart, because they automatically configure themselves based on the type of cable plugged into them. If a "patch" or "straight" cable is used, to connect two computers with "smart" NICs, the NIC will configure itself to switch the Tx and Rx.